Window Seat Cushions Custom Sewn Plus Matching Pillows - Sew What? Sew Anything! 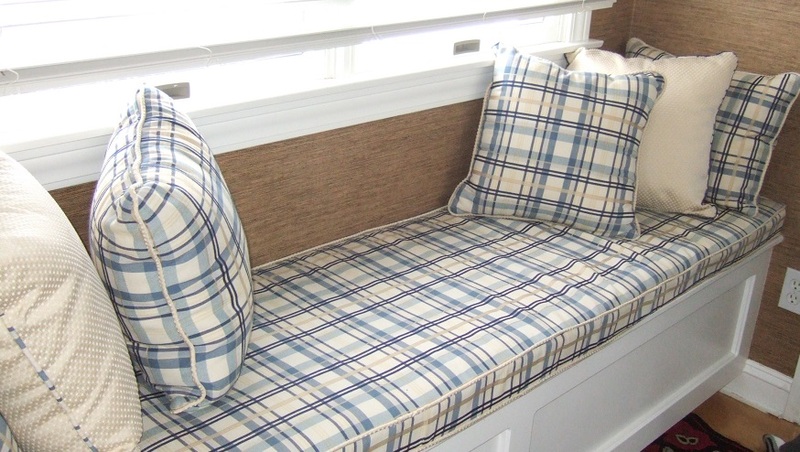 Window seat cushions are a great fast project to give any room a pick-me-up. This project was doubly fun as it was for my friend’s home.The breezy plaid fabric was a perfect choice for the home decor, nicely contrasting the white wooden trim. The window seat is located in a small area with a bar. It’s a really cool feature of my friend’s home. The fabric looked even better with coordinating fabric for the cording on the pillow and the pillows made this spot extra cozy. Now my friend has a comfy place for sitting and relaxing and to enjoy a glass of wine with visitors. I have a great distributor for foam and am able to make any size cushion for my clients. Use my contact form if you would like a quote on your window seat cushions project.